InTruBeauty: Kate Somerville Summer 2013 Launches! 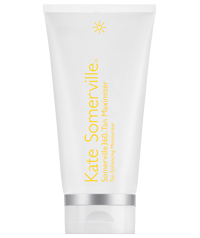 Kate Somerville has quickly become one of my favorite skincare brands. I love her products. Below find information on Kate's new product releases for summer. I will be bringing you some reviews of these later as well! This ultra-fluid, waterlight sunscreen blends effortlessly into skin, providing hydrating, SPF50+ broad spectrum protection and anti-aging benefits. $48 / 1.7 Fl. Oz. Don't Let Your Golden Glow Go! Stay gorgeous, golden, and glowing with a unique formula that conditions and moisturizes skin for a longer lasting tan. A specialized Peptide and Lipid Complex hydrates skin to help maintain a sun-kissed look after using self-tanning products or sun exposure. $48 / 5 Fl. Oz. Quick and easy-to-use self-tanning applicators that offer an incredible sun-kissed look without uneven tone or streaking! 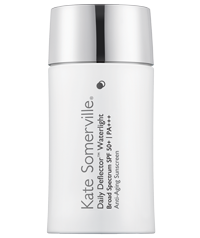 The advanced formula works with your skin’s own proteins to gradually darken to an ultra-natural color in two to four hours. 1. Prep skin with ExfoliKate Intensive Exfoliating Treatment and ExfoliKate Body Intensive Exfoliating Treatment to buff dead, dull skin from the surface and ensure even application of self-tanning formula. 2. Apply moisturizer to extremely dry areas like elbows or knees, and follow with Somerville360 Body Tanning Towelettes. Use in circular motions to avoid any missing areas and uneven streaking. 3. After, apply Somerville360 Tan Maximizer Tan Enhancing Moisturizer liberally to body to enhance and prolong your tan. 4. When finished, wash palms with soap and water so that you don’t end up with pale hands and tanned arms! I haven't tried anything from this brand but it sounds so great!